BGinfo.exe older than version 4.22 can be used to bypass application whitelisting using vbscript inside a bgi file. This can run directly from a webdav server. This documentation is very interesting to read and I highly recommend reading it. My main inspiration for finding this bypass technique comes from Matt Graeber (@mattifestation) and Casey Smith (@subtee). A big thanks to Matt and Casey for their inspiration and also a special thanks to Casey for helping me out and verify the vulnerability. You guys rock! After being in Israel at the Bluehat conference with these guys, and watching their session: “Device Guard Attack Surface, Bypasses, and Mitigations” (Slides: https://microsoftrnd.co.il/Press%20Kit/BlueHat%20IL%20Decks/MattGraeber.CaseySmith.pdf) I started to really look into this and it is an interesting field to do some research. They said that more people should look into misplace trusts and so I did. This is my first blogpost about a bypass technique, so I hope you like it. When you enable an application whitelisting solution (Device Guard/AppLocker) you must specify what to trust. The most common thing to do is to trust every binary that is signed by Microsoft. This is a problem, because you allow every signed binary from Microsoft to run code. It is important that we know about these misplaced trusts and mitigate them so attackers can’t leverage them. 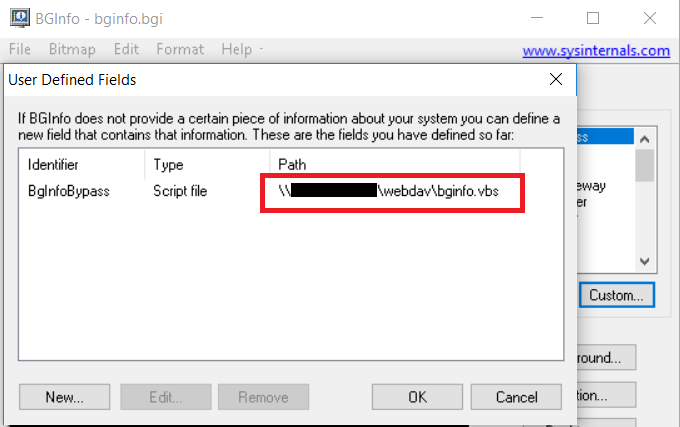 To bypass application whitelisting with bginfo you must first create a VBscript file that you want to execute. This can either be saved to disk on the system you want to run the script or you could serve it through a Webdav server from the internet (more on that later). Just a quick PoC example first that shows you the basics. Create a folder within the system called C:bginfo. Download bginfo 4.21 or older (will not work with 4.22) and save it to the folder. Note that you type in bginfo.vbs and not the entire path (That will happen if you browse). If you type in just the filename the script file must be located within the same folder. Now your shell will probably already popup. But this is not the coolest part. (evil laugh) The coolest part is that you can also run this directly from a webdav server. How cool is that? In order to do that you will need to upload the files you have generated to your internet facing webdav server. There are lot of tutorials on how to setup a webdav server online and I will not cover that in this post. 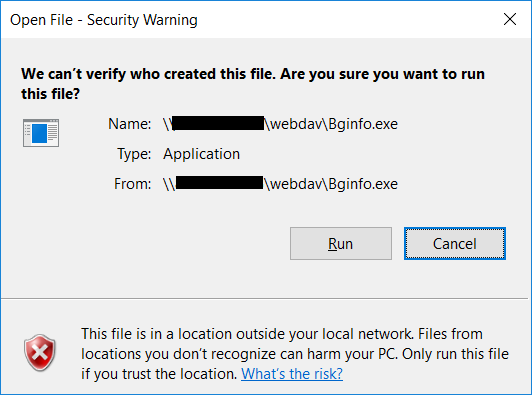 Microsoft has changed the code in bginfo.exe and this bypass should not be able in the 4.22 version that was released on 16th of may. That version is a result of this bypass technique. You can thank me later Mark Russinovich. VBSMeter is really cool. Awesome work! If you happen to “stumble” upon writable .bgi files on your Redteam or pentest assigments, I would really give try to inject VBSMeter into the loop. I can remember that I have actually seen writable .bgi files in previous pentests, but I was not aware that it could be weaponized. Think of the scenario, where you add VBSMeter to a bgi file that is updated on all the computers/servers in the domain. Do I hear the sound of raining shells? Also, hope that I have not offended Mark Russinovich in any way. I really love all sysinternals tools, both for offense and defense.